When TDmonthly interviewed retailers in a Fall 2012 survey about best selling tween products, their answers varied widely. From jewelry and fashion to robots and electronics, the Top-10 Most-Wanted Tween Products below offer a little something for everyone. Girls can create a portfolio book of fabulous fashion creations with a little glitz and glamour flair, using the 50+ stencils and create red-carpet-worthy designs. Launch date: August 2009. — Kim Emigh, VP of E-commerce at Growing Tree Toys in State College, Pa., told TDmonthly in a Fall 2012 survey that Fashion Angels Fashion Design Sketch Portfolios were one of their best selling tween products. HEXBUG Warriors Battling Robots by INNOVATION FIRST LABS, INC. Kids can operate their HEXBUG Warriors in Training Mode, with unlimited health, for scrimmages and testing purposes. Once the Warriors are equipped and ready for battle, they can be powered into Match Mode and are set to enter into competition, where they crash, jab and jostle with their opponents until they win or lose by running out of health at which point they deactivate. Once put in Match Mode, each robot’s Shock Sensor activates its Damage Indicator Light which changes colors from green to red and blinks more rapidly as its health decreases. There are 12 assorted HEXBUG Warrior Battling Robots Single packs available for fans to collect. Each Single pack includes 1 fully-armored Warrior. — Mary Porter Green, owner of Curiosity Zone in Ashbburn, Va., told TDmonthly in a Fall 2012 survey that Hexbugs are one of their bestselling tween toys. "In a good month, we sell dozens," she told us. 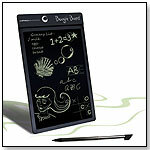 The original Boogie Board LCD eWriter that started a revolution. Ultra light (4oz.) and thin (1/8"). One just isn’t enough. Get one for on the go, in the office and multiple places around the house. Almost anywhere you’d keep memo pads, sticky notes or scrap paper. — Erika Evers, owner of Dancing Bear Toys in Hendersonville, N.C., told TDmonthly in an April 2012 survey that their best selling travel toy is the Boogie Board. They sell 6-7 each month. — Chris Lowe, owner of Beanhead Toys in Sandy Springs, Ga., told TDmonthly in a late Summer 2012 survey that they sell 15 of this item each month, making it a bestselling novelty item. — Greg Larson, owner of Larson's Toys and Games in Columbus, Ohio, told TDmonthly in a March 2013 survey that they sell 18 Boogie Boards each month, and up to 48 a month during 4th quarter. 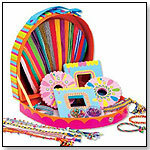 MOGO Magnetic Charmband and Charms by MOGO DESIGNS, INC.
Set of 10 Gourmet Scented Pencils in reusable zippered pouch. Smencils are made from 100% recycled newspaper soaked in natural gourmet liquid fragrance. Scents include: Bubble Gum, Orange, Cinnamon, Grape, Root Beer, Watermelon, Black Cherry, Very Berry, Tropical Blast, and Cotton Candy. Each individual Smencil is packaged in its own freshness tube made from biodegradable, corn-based plastic. 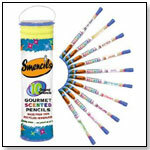 Smencils will retain their scent for up to 2 years and each time you sharpen your Smencil the scent is refreshed. — "We sell about 50 per month. We're expecting this to be a big stocking stuffer,'' Christine Osborne, co-owner of Wonder Works in Charleston, S.C., told TDmonthly. — William Meredith, owner of Learning Express in Cary, N.C., told TDmonthly in a Fall 2012 survey that they sell 100 Smencils a month, making them one of the store's best selling tween products. Thinking Putty Super Illusions by CRAZY AARON ENTERPRISES, INC.
LockerLookz Wallpaper for lockers comes in eight fun patterns. The wallpaper is held up by 20 super-strong magnets, making sure no damage is done to the locker itself. The LockerLookz line of Wallpaper and accessories allows kids to personalize their space at school. — Betsy Ordemann, owner of Magic Box LTD in New Orleans, La., told TDmonthly that she sells dozens of each piece of the LockerLookz line each month, and up to 3 dozen of the most popular pieces. “It's unbelievably popular. It's totally different than anything else in the market,” she said. — Christine Osborne, co-owner of Wonder Works in Charleston, S.C., told TDmonthly in an October 2011 survey that LockerLookz was their best selling tween item. "We don't know how many" are sold, she said, "because it sells out too quickly!" — William Meredith, owner of Learning Express in Cary, N.C., told TDmonthly in a Fall 2012 survey that they sell 100 LockerLookz products each month, making them a best seller in the tween category. These large plush Uglydolls have a mini Uglydoll in their pouch. Launch date: May 2012. — Shana Hack, owner of Moon Rabbit Toys in Santa Fe, N.M., told TDmonthly in a Summer 2012 survey that they sell a couple dozen Ugly Dolls each month, though sales have slowed slightly. — Bill Sartain, owner of Tutoring Toy in Salt Lake City, Utah, told TDmonthly in a Fall 2012 survey that Ugly Dolls are one of their best selling tween products. These bracelets are made with genuine 550 pound test paracord, similar to what paratroopers use in their military operations. These are tightly woven into a bracelet, which can be unwoven in emergency situations. — John Taylor, owner of O.P Taylor in Brevard, N.C., told TDmonthly in a Fall 2012 survey that paracord jewelry was one of their best selling tween products. — Mary Porter Green, owner of Curiosity Zone in Ashburn, Va., told TDmonthly in a Fall 2013 survey that paracord survival bracelets are a best-selling jewelry item.